The 8NA junction boxes are part of the 8NA series, a RCC-E K1 qualified nuclear grade range. Thanks to multiple inputs and outputs on the boxes, they are ideal for cabling many safety related equipment. 8NA junction boxes are supplied by SOURIAU worldwide in nuclear power plants. They provide high shielding performance as the shell-to-shell resistance is reduced (≤ 20 mΩ) and the EMI/RFI protection is achieved over a wide frequency range. With multiple inputs and outputs, up to 14 different combinations, 8NA junction boxes are ideal for cabling optimization. The 8NA series meets the highest radiation levels and harshest nuclear environment, complying with LOCA safety requirements. 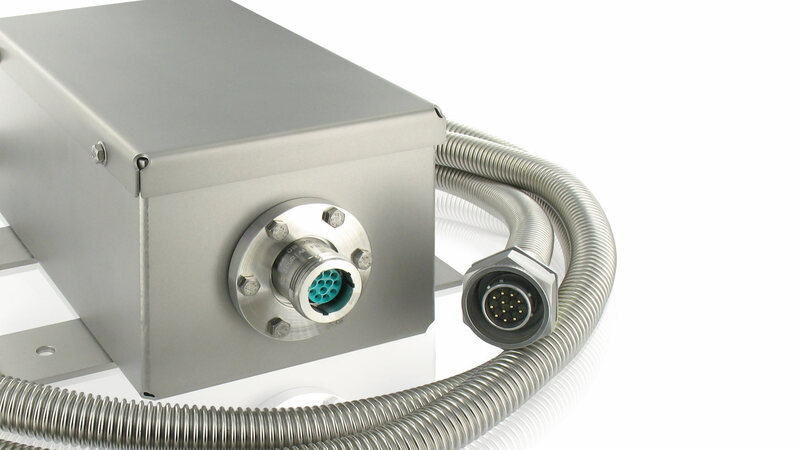 Esterline Connection Technologies - SOURIAU's range complies with the main nuclear industry standards (RCC-E and IEEE). Temperature envelope: 156°C (313°F) max. Pressure envelope: 5,6 bars (81 psig) max. A total of 14 different boxes references with inputs and outputs made of receptacles and cable clamps. With standard or with bonding and shielding continuity cable clamps.